If the backup quarterback is the most popular guy in town (as the old football saying goes), what does that make the third-string quarterback? Even more popular, or obsolete? Typically, when a team is talking about a third-string quarterback, it means all hope is lost and the season is all but over. However, there are rare circumstances where a long-shot quarterback has defied the odds and climbed the depth chart to earn the starting job, from all-time greats such as Roger Staubach to journeyman players such as Matt Moore. 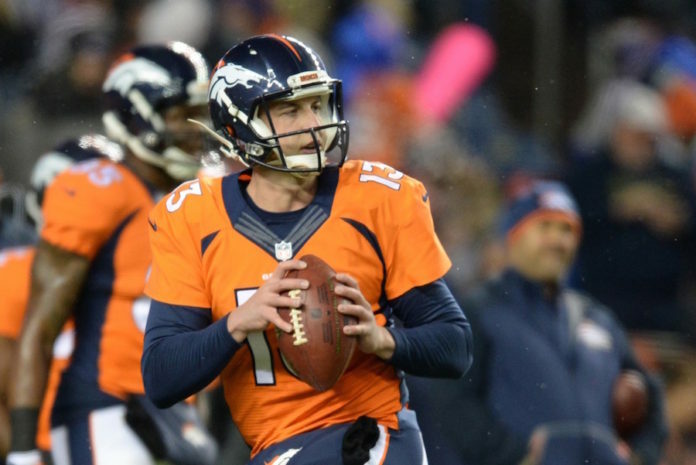 Trevor Siemian hopes to be the next. As the third-string quarterback behind Peyton Manning and Brock Osweiler last year, Siemian was an afterthought. This season, he has a real chance at becoming the starter. The sentiment on Siemian is that he can’t be taken seriously for becoming the starter because he played his college ball at Northwestern, was drafted in the seventh-round and was the third-string quarterback last year. The odds certainly weren’t in his favor entering the NFL, but they weren’t for any of the players below either, and they all found a path to beat the odds. Can Siemian overcome the odds? Here are eleven players that did. Matt Hasselbeck, a sixth-round pick in 1998, spent his first three seasons in Green Bay as Brett Favre’s backup before being traded to the Seattle Seahawks. In Seattle, Hasselbeck found himself in a tight quarterback competition with Trent Dilfer for the 2001 and ’02 seasons. In 2003, Hasselbeck earned the starting role, took his team to a 10-6 record and earned a spot in the Pro Bowl. After going undrafted in 1997, Jake Delhomme bounced back-and-forth from the New Orleans Saints practice squad and NFL Europe before finally landing as a backup with the Carolina Panthers in 2003. Delhomme took over for a poorly performing Rodney Peete the first game of his Panthers career and led the Panthers to eight game-winning drives, the most ever in a single season. Tony Romo spent the first three years of his career primarily as the holder for placekicks after going undrafted in 2003. Following great preseasons in 2004, ’05 and ’06, Romo rose from third-string quarterback to backup. On October 23, 2006 Romo finally got his shot, replacing a struggling Drew Bledsoe during halftime. Romo has been the face of the Cowboys ever since. As an undrafted rookie in 2007, Matt Moore wasted no time overtaking David Carr and Vinny Testaverde en route to becoming the Panthers’ starter in December of his rookie year. Moore finished the season as the team’s starting quarterback, but missed the entire next season with a broken left fibula. He battled injury in 2009, but was the primary starter entering the 2010 season. Roger Staubach was drafted in the 10th round in 1964, but due to military obligations wasn’t able to join the Cowboys until 1969. Staubach backed up Craig Morton until 1971, when he took over in Week 2. In a fierce quarterback competition, both quarterbacks played in Week 7. Staubach won that battle and led the Dallas Cowboys to their first Super Bowl win, being named MVP of the game. Jeff Garcia battled an uphill road in both the Canadian Football League, as a backup to Doug Flutie and Steve Taylor, and in the NFL, as a backup to Steve Young with the San Francisco 49ers. As a rookie in 1999, Garcia shared time with Steve Stenstrom, but in 2000 Garcia took over full-time, earning his first of four trips to the Pro Bowl. Garcia went undrafted in 1994 and didn’t make it to the NFL until 1999. One of the most well known NFL stories is Kurt Warner’s journey from going undrafted in 1994 to working at a grocery store to starring in the Arena Football League to becoming Super Bowl MVP, all in just five years. When Warner finally made the St. Louis Rams roster in 1998 he was the third-string quarterback. In 1999, when Trent Green tore his ACL, Warner took over and led his team to a Super Bowl victory. Undrafted in 2002, Shaun Hill had to wait until December 2007 to get his first start. Hill was a third-string quarterback on multiple teams, finally getting his first start with the 49ers after Dilfer suffered a concussion. Hill beat out Alex Smith in 2009 and was named the starter for the season, but after poor play Smith took over midyear. Marc Bulger went from being a sixth-round pick in 2000 to signing a massive extension with the Rams in 2007, making him the highest-paid player in Rams history at the time. After spending the 2001 season inactive as the Rams third quarterback, Bulger got his first opportunity in 2002 after Jamie Martin and Warner were injured. Bulger went 6-1 in those starts and in 2003 led the Rams to a first-round bye. Brad Johnson was drafted in the ninth round of the 1992 draft by the Minnesota Vikings. After his first two seasons as the third-string quarterback, Johnson became Warren Moon’s backup in 1994. To receive playing time Johnson had a short stint in the World League in Europe in 1995. In 1996, after Moon was injured, Johnson started eight games. He became a full-time starter for years to come. Arguably the greatest value draft pick ever, Tom Brady was selected in the sixth round, 199th overall in 2000. At one point in his rookie year, Brady was listed as the fourth-string quarterback, but ended the season as Drew Bledsoe’s backup. The following season, Brady took over during the second game after Bledsoe was injured and lead the Patriots to their first Super Bowl victory, his first of four.